I don't think I have ever posted a word of the year... but this year is going to be different. This year I am going to have patience. When the toddler is testing me. When the baby is still growing and making me even more uncomfortable. When the husband puts the laundry next to the hamper instead of in it. When labor doesn't happen at the snap of a finger. When the baby is crying and the toddler decides it is the perfect time to throw a fit over nothing in particular. When that thing I asked the husband to do five times, still hasn't gotten done. When the dog wants to go outside at the same time that all the timers go off announcing that dinner is done. When 5 o'clock rolls around and I'm this close to completely losing it. I will be the first to admit that I am not always patient with motherhood, being a wife, the everyday things of life. I'm easy to fall apart when things get stressful and so I hope that 2016 brings me the patience I will need to adjust to being a mother of two. Things on my plate are about to double and I have to learn how to take those in strides. You got this mama!! You are awesome! Gosh I need more of this! I'm such an impatient girl. 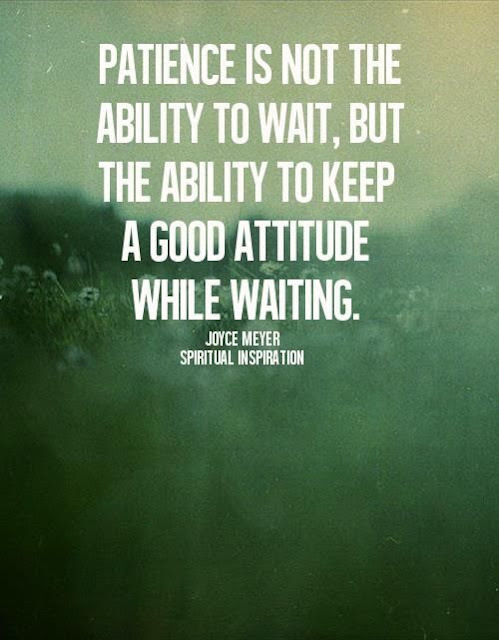 Yes, I need more patience as well.